Autosport journo Marcus Pye was the magazine's regular test driver for an amazing length of time. A columnist for years and years through his weekly "Humble Pye", he has some years ago returned to the roots of British motor racing that is the huge UK club scene - probably the largest local racing scene of the world when compared to the number of United Kingdom inhabitants. Today Pye's column is to be found in the Club Autosport section in the back of the weekly mag, and it usually relates to a visit to one of the events on the busy MSA calendar. Testing the Colin Bennett Racing-run Lotus 78 that Norman Dickson would race in the 1980 AFX Aurora F1 series was a perfect fit for both of Marcus' roles - that of test driver and club reporter. For with the Aurora championship the British in fact were spoiled with a brief comeback of contemporary F1 racing at club level. During the fifties the trail of British non-championship F1 events was long and entertaining, and allowed a flurry of wealthy and not-so-wealthy amateurs to race their sometimes hairbrained self-designed machines against the customer Coopers and Maseratis of even more gentleman drivers. And the class of the British Grand Prix regulars were taking them on, with quite a few guest appearances by some of the foreign stars as well. The sprint events at Goodwood, Snetterton, Castle Combe, Oulton Park, Boreham, Crystal Palace and Charterhall, to name but a few, could regularly boast an impressive list of winners. Some of these traditionals continued to be into the mid-sixties. The advent of 3-litre F1 and "big banger" sportscars soon put an end to most of the non-championship events, many of the smaller tracks quickly becoming too unsafe for the huge increase in speeds. While some of the circuits simply closed, recognizing that they were past their sell-by date, the majority diverted their interest to the new F2, and Snetterton and Oulton Park became regular fixtures on the F2 calendar, with Goodwood "replacement" Thruxton soon following suit. The British F5000 championship that started in 1968 became another visitor to the smaller British tracks, including Mallory Park and a rejuvenated Donington Park. With the F5000 series succumbing under its own success at the end of 1975, the seeds were sown for a return of F1 cars to the British club scene, as for 1976 and continuing in 1977 the Shellsport Group 8 series was created, that allowed F1, F5000 and F2 cars to race each other on British tracks ranging from Silverstone and Brands to Snetterton and Mallory Park. In 1978 this morphed into the Aurora AFX championship for F1 cars and a F2 'B' class. 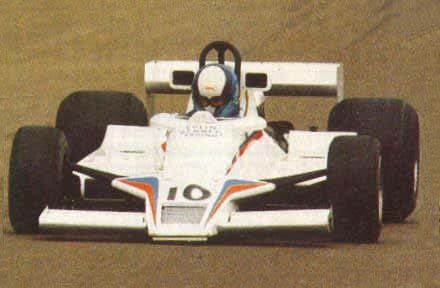 In 1976 an F5000 car was still the car to have, David Purley taking the inaugural Shellsport title with a LEC-backed Lola-Chevy. But in 1977 Tony Trimmer became the new "British F1" champion on board a Melchester-run Surtees-DFV, and after switching to a McLaren M23 for the first Aurora series, swept that championship as well. The usual Aurora suspects were driving older F1 machines, usually relatively uncomplicated British DFV kit cars such as the M23, the Surtees TS19, the Wolf WR, the Fittipaldi F5A, the Arrows A1, and the pictured Lotus 78 and all-conquering Williams FW07 wing cars, but the BRM P207 also appeared at several stages at the hands of 1973 and 1975 F5000 champion Teddy Pilette and, once owned by John Jordan, a man no less than Tony Trimmer. But there were also some new F1 designs that were exclusively raced in the Aurora series, such as the Chevron B41 and the race-winning March 781 and Surtees TS20. The original Lotus 78/1 (JPS 15) was one of the stars of the 1979 season, but not by the time Norman Dickson got his hands on it. Although Emilio de Villota probably thought he had the car to beat, and indeed won races back-to-back races at Thruxton and Zandvoort and at Oulton Park and Nogaro, he found himself outgunned by a Wolf WR and an Arrows A1 and probably the greater talents of David Kennedy and Rupert Keegan as well. So at the end of the season Emilio tried again to gain the unfair advantage, and this time he succeeded in acquiring a pukka FW07 that he would need to beat journeyman Chilean Eliseo Salazar in a similar FW07 and the reasonably talented Guy Edwards, the man that had turned the March 781 and the Fittipaldi F5A into winners, but now had to make do with an uprated version of the 1978 Arrows A1. With the infinitely better car, Villota eventually waltzed to the championship. The 78/R1's new occupant, Norman Dickson, fared slightly less well in a now ageing design but did perform up to the inherent possibilities of the car. In 1979 Dickson had been racing an F2 March 792 with Hart 420R power, entered by Dicksons of Perth. It was not unusual for Dickson to be the best F2 runner in 1979, taking five class wins and an overall 4th in the Gold Cup as his best results, to win the F2 title. With the 78 tested by Pye in an intermediate colour scheme, Norman took over the car for 1980, stepping up to the F1 class. He started off well, taking second in the race of attrition that was the Evening News Trophy and was won by Désiré Wilson - the only time a woman ever won a Formula 1 race. In the fourth round, the Sun Trophy at Mallory Park, Norman repeated his Brands Hatch performance, having started an excellent 5th from the grid, with a 4th grid spot at the International Trophy already under his belt. But at Thruxton a real brake caliper broke on the penultimate lap, leaving Norman a disappointed 11th on the line. And that was it as far as Dickson's 1980 Aurora season was concerned. For the Monza Lottery race Colin Bennett replaced Dickson with Kauhsen and Merzario refugee Gianfranco Brancatelli, who crashed out after having qualified 6th. With Bennett switching his support to Val Musetti's heavily revised Fittipaldi F5A, the Lotus 78 went into apparent retirement. But it took the car just two months to reappear as the second Colin Bennett car at the Pace Petroleum Trophy, Désiré Wilson retiring it during the race. Then it made a final appearance before briefly returning as a historic racer owned by Roger Friend. The honour was given to one of the more enjoyable of F1 mystery drivers, Colombian Ricardo Londono-Bridge. Londono drove the second Colin Bennett entry at the final Aurora race, the Pentax Trophy held at Silverstone. It was an embarrassing experience for a car that was once raced by Mario Andretti and Gunnar Nilsson. Having qualified 18th after several mishaps during the session, ahead of only two F2 Chevrons, beaten by several other Chevron and March F2 cars, and some 11 seconds of pole man Villota's pace, Londono brought the car home in 7th, with top F2 runners Paul Smith and Kim Mather ahead of him. Not a performance that Chunky would have been proud of.